Kitchen countertops are one of the last design decisions you make in a remodel and, actually, one that can have the most impact on your overall design. If you think about it, other than your cabinetry, solid surface countertops actually cover the most visual area in the room. As such, it is important that, not only to the coordinate well with the rest of the finishes, but also that they make the right design statement on their own. 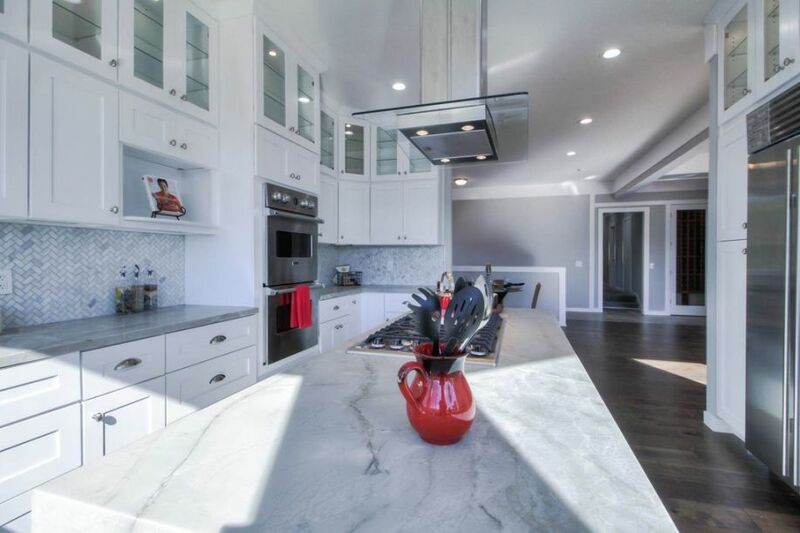 When in doubt, I tend to choose white granite countertops because they blend well with any color palette, and can pair well with both traditional and contemporary styling. As you can see in these photos, with the right accessories, this kitchen could be considered modern or traditional depending on the direction you decided to take it. 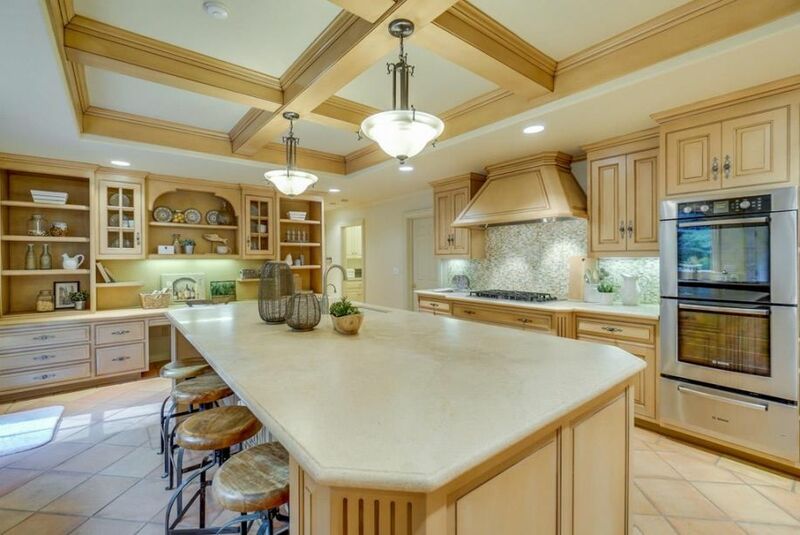 Kitchen countertops are one of those elements that can certainly make or break a room. I have seen absolutely beautiful spaces with gorgeous cabinetry, lighting, and decorative accents but that are ruined by cheap formica countertops. More high end materials like granite or quartz countertops are far more affordable these days than they used to be and, in my opinion, it is so worth the expense to have that final piece in your room. They may be a bit more expensive than formica, but they last so much longer and, ultimately, will help rather than hurt the resale value of your home. I especially love a popular marble-look quartz countertop paired with grey kitchen cabinets like we did in this room because it creates the perfect blend of both contemporary and traditional styles. One of the first things that I look at when I walk into someone's home is their kitchen countertops. This is likely because we just went through a renovation ourselves, but also because I think it really says a lot about the designer with what they picked. As you can see, we went with white quartz countertops because we loved the neutral look that it brought to the kitchen. Against the beige painted cabinetry and polished nickel fixtures, we didn't want anything too bold that would take away from these other elements. At first I had considered marble countertops, but we felt that the heavy white and grey pattern may be too much against the shade of our cabinets and the other elements we knew that we would add to the space. I find that kitchen countertops always play a huge role in making your space look finished and professionally designed. 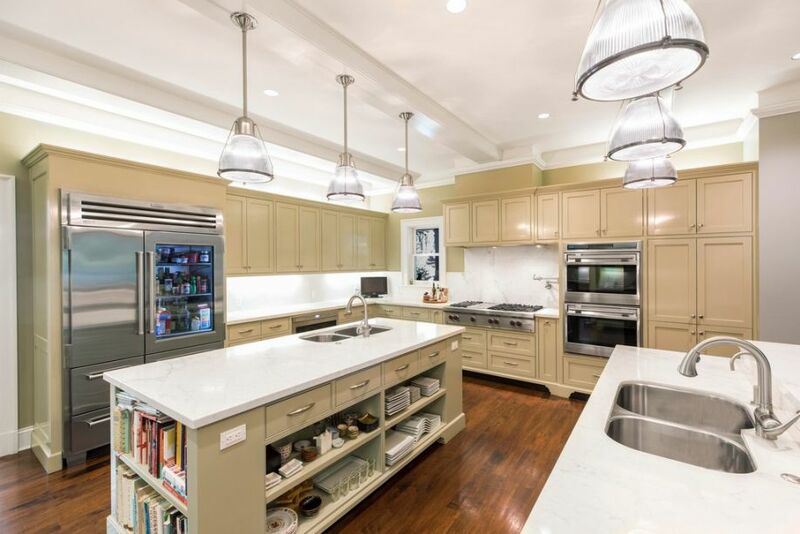 Choosing between solid surface, marble, formica, and granite countertops may seem like a bit of an amateur decision, but the right material can actually have a huge impact on the space. I tend to avoid formica at all costs because I find that it generally downgrades the look of the kitchen. There have been some strides made in how they produce those products but I still think that they should be avoided unless absolutely necessary. 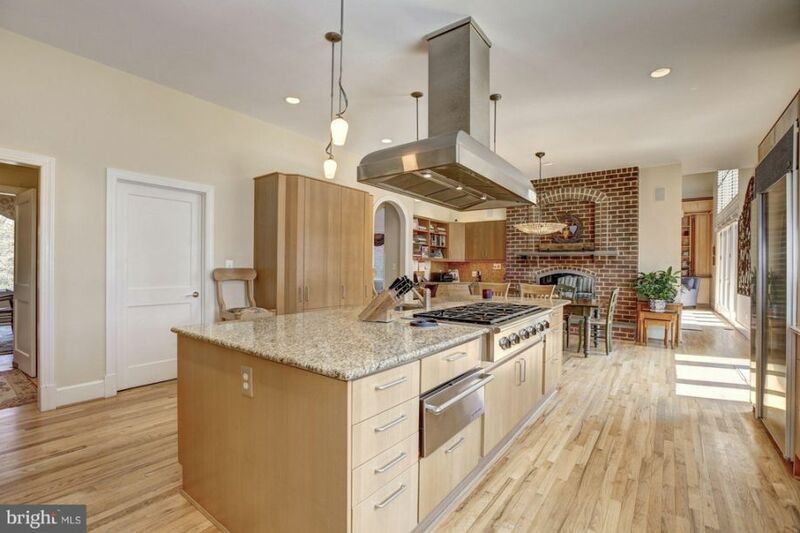 My top choice is generally granite like we used in this home because it blends well with anything from a modern space to a more traditional brick backsplash kitchen like this one. Kitchen countertops are a very underrated design element in my opinion, most people select these pieces as afterthoughts, not really giving much consideration to how they will blend with the overall design. 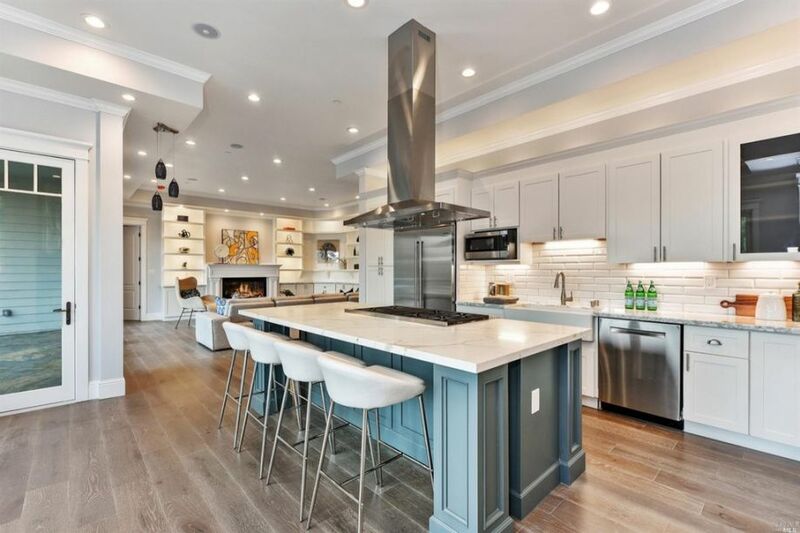 This is a shame because great butcher block countertop or beautiful solid marble work surface can be such an asset to the overall look of the space. 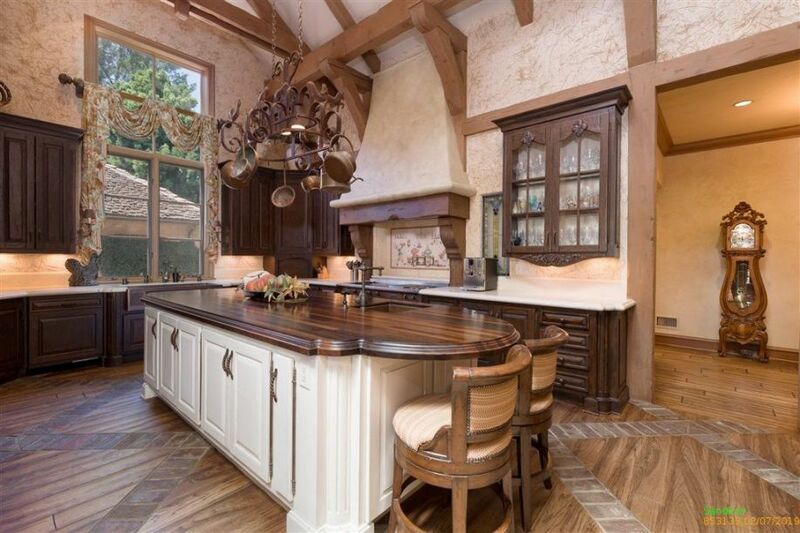 Take this beautiful rustic cottage kitchen for example, the polished dark wood butcher block used on the island really grounds the design and looks ultra luxurious. Then, paired with a gorgeous simple white granite for the rest of the counter space, these materials really elevate the entire design. As we were designing this space for our clients, the one request that they had was to incorporate some kind of marble kitchen countertops. I love the idea of marble but it is quite hard to maintain, especially in a room as high traffic as a kitchen, and can stain quite easily. However, there are quite a few kitchen countertops options nowadays that have the same great look of marble but that are much more durable and easy to maintain. I have seen a few quartz options that feature the same shades and a similar pattern, but they can be quite costly. For this kitchen, we decided to go with soapstone countertops because they look extremely similar to marble and are incredibly durable.